We have a cultural bias against insects. We think of them as icky, squirmy etc. Other cultures do not share this bias and they even eat insects as part of their regular diet or as special treats. 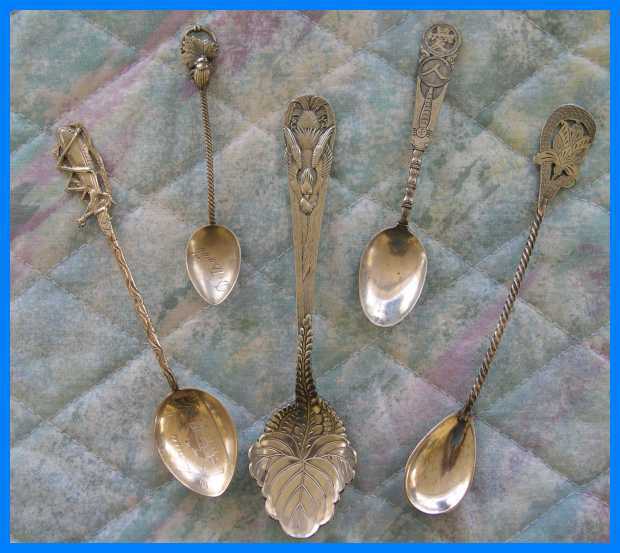 There are a few American spoons with insects, but they are rather rare. 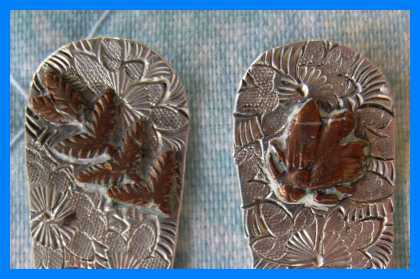 However, I have found some spoons from other countries which do depict insects. 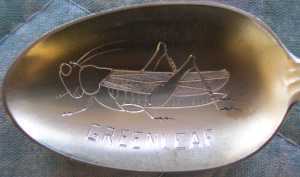 This grasshopper is found a spoon from the Philippines which also features a hand engraved hut in the gold washed bowl. Marked in Chinese script. 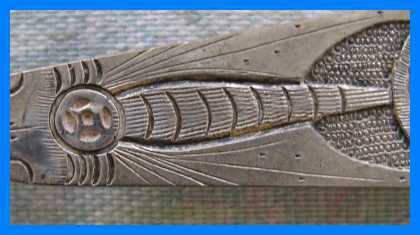 A dragonfly is found on this Chinese spoon which also features Chinese script symbols. 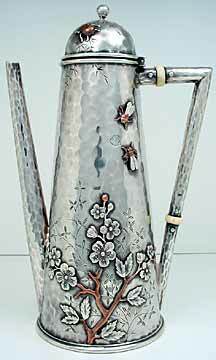 Chinese markings. I am unsure as to exactly what is being depicted on this very interesting Chinese spoon which also features an unusual shaped bowl. 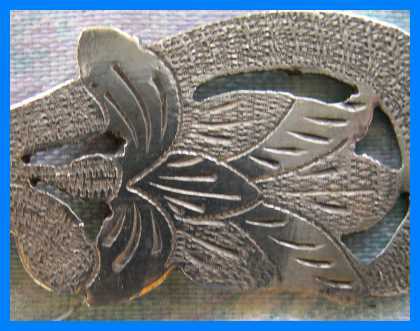 It is even possible that this is a representation of some type of bird. Opinions? This spoon is very detailed but it is unmarked and it may not be silver. This small twisty handled spoon features a lady bug munching on a leaf. The bowl is engraved "Detroit". The only mark is 'sterling'. 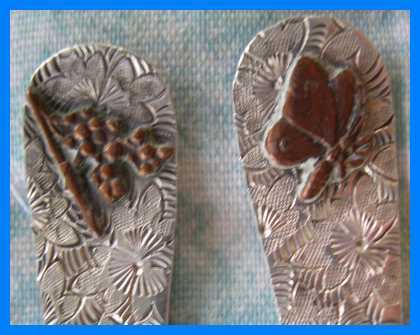 The spoon on the right in the first picture seems to be a butterfly. 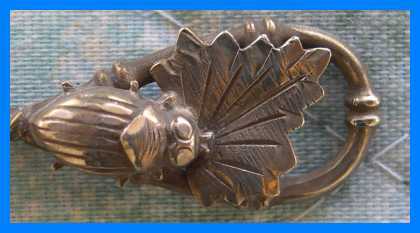 This is a Navajo made spoon which is featuring an engraved centipede in the bowl. Centipedes are common insects in the south west desert and the picture to the right is a stylized woven "centipede rug"
Inexpensive lands and the hope of a better life brought many settlers to Kansas in the years following the Civil War. Life on the frontier, however, had drawbacks. Indian attacks, droughts, depressions and grasshoppers discouraged settlement on the Kansas frontier. Grasshoppers posed a threat to farmers many times but no year was worse than 1874 when millions of the hoppers, or Rocky Mountain locusts, descended on the prairies from the Dakotas to Texas. In late July they came without warning in swarms so large they blocked out the sun and sounded like a rainstorm. When a swarm landed, the omnivorous pests brought near total destruction. Crops were eaten out of the ground, as well as the wool from live sheep and clothing off people's backs. Paper, tree bark and even wooden tool handles were devoured. Hoppers were reported to have been several inches deep on the ground and locomotives could not get traction because the insects made the rail too slippery. Settlers did their best to stop the hoppers by raking them into piles, like leaves, and burning them but these efforts were in vain because of the sheer numbers of the pests. The hoppers usually stayed from two days to a week and then left as they had come, on the wind. The areas hit the worst were the least prepared for such a disaster, where most of the settlers were new arrivals, who had not had time to establish themselves in their new homes.